The Telecommunications Ministry and the Guyana Telephone and Telegraph Company (GTT) have struck a major deal which would see major upgrades to Guyana’s cellular networks and WiFi hotspots at strategic locations across the Georgetown in time for the 50th Anniversary celebrations. 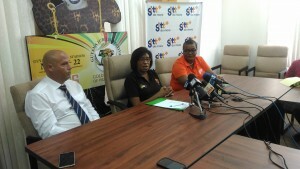 Telecommunications Minister Cathy Hughes on Friday announced that the Government has partnered with the telephone company to ensure that the plans are rolled out in Time for Guyana’s Jubilee festival. She revealed that while the Telecommunications Bill is slated for Parliament soon, some immediate upgrades will have to be made. The Bill will essentially liberalize the sector allowing for faster flow of information and remove a monopoly currently held by GTT. “I was disappointed that when I took this position we were still only operating on a 2G platform and we are looking to improve on that before the event. In my discussions with the telephone companies we are looking at other avenues where we want to ensure that we create easier access, in terms of a minimum – hotspots at key areas,” said Minister Hughes. Two of those sites have already been identified as the Tourism Ministry which will serve as an information hub and the Jubilee Stadium along Homestretch Avenue. “So I know they are looking at creating easier and faster internet access in the environment of the stadium. I don’t think that the Manager would object to me saying that he has agreed with me to provide at the Ministry here another GTT hotspot in the vicinity of the stadium,” she noted.